Baths can have metaphysical properties. They can cleanse the aura, open the mind, cultivate intuition, clear negativity and help the spirit soar. And for those of you who may have been neglecting yourselves, invigoration might just be what you need. Purpose: This bath helps remove mental/physical blocks that may be preventing the success you desire. Lavender releases emotional conflicts blocking spiritual growth, while lemon promotes mental clarity. 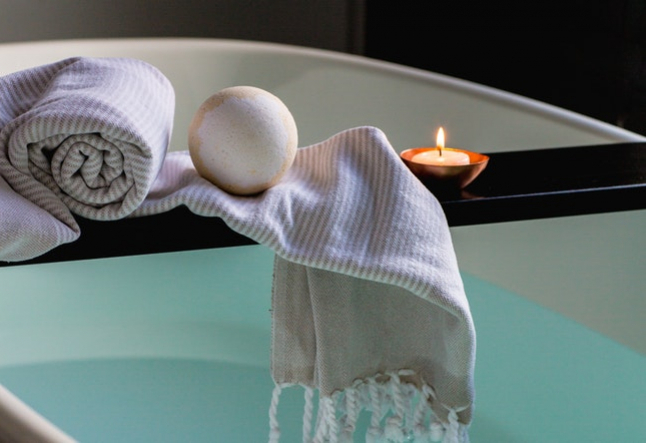 How to: This bath should be taken in the morning to get the full benefit of its clearing energies. If you’re nervous about exams or a presentation at work, this is a great way to prepare your mind. As you are bathing, visualize the actual blocks being loosened from around your heart and solar plexus area (located around the abdomen). As they loosen, swish the water around you and feel them dissolve. Quickly rinse yourself with warm water to physically cleanse the ‘blocks’ from your body. Feel them whirl down the drain and out of your life. This block comes from a lack of joy. If we have free flowing joy we are able to accomplish anything. Look at the pure joy that a child embodies. A child doesn’t perceive barriers or obstacles but runs free. Invoke this sense of freedom into every cell of your being while you are soaking in a bath. Laugh out loud, make some noise. A child doesn’t think and analyze every action - he or she simply does, flowing without inhibitions and expressing that which needs to be expressed. What is the barrier that prevents you from following through with your creativity? Joy knows no boundaries. As you lie in the tub, bring your awareness to the beautiful fragrances from the oils. Close your eyes - inhale and exhale. Inhale again deeply, and as you breathe out, release any negativity from your body and mind. This is a time for letting go. Imagine yourself becoming empty - your mind is a quiet tranquil woodland pool. You are all alone. You are free to experience pleasure. Imagine that this freedom gives you the power to create anything you want. Feel the love in your heart - experience your soul resting there. This is your true identity - pure love and pure beauty. Let the love bubble up inside of you and flow to every cell of your body. You are drifting to a new place of complete peace. There is nothing else - only contentment. You are the manifestation of a wondrous miracle of life.